In the previous post (Building a sub $300/month Oracle RAC on AWS - Part I) we discussed the network setup required for Oracle RAC. In this post we will explore setting up shared storage required for Oracle RAC. Oracle RAC is a shared storage system, every node in the cluster Read/Write to the the same storage system. In enterprise set up this space is dominated by enterprise storage companies like EMC, NetApp etc. EMC provides block storage for Oracle and NetApp provides Network Attached Storage for running shared storage for Oracle RAC. We will explore using block storage in AWS to setup RAC. 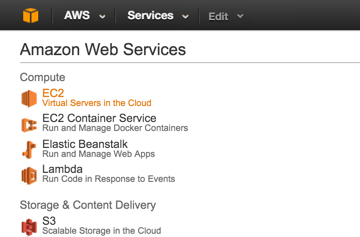 AWS is working on providing NFS or Elastic File System in their cloud. This is in beta currently and not generally available. Whenever I have access to EFS I will update this document on how to use EFS for RAC. iSCSI storage - iSCSI stands for “Internet Small Computer System Interface”. It’s basically block storage using TCP. iSCSI Initiator - Connects external iSCSI-based storage to hosts with an Ethernet network adapter over TCP. iSCSI Target - Host which acts as a storage device capable of providing shared block storage in the form of virtual hard disks (VHDs) to clients across a TCP/IP network. In our case the Oracle RAC instances would be iSCSI initiators and storage instance iSCSI target. 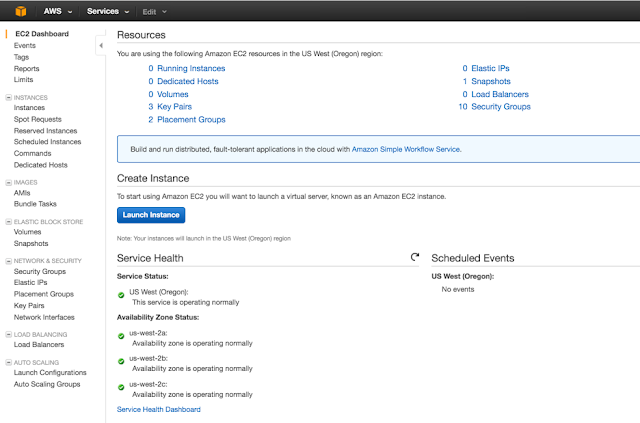 Let’s spin our first AWS EC2 instance which is act as our iSCSI target or the storage server. In our effort to remain cheap let’s spin a “t2.micro” instance with Ubuntu OS. T2.micro instance has 1 CPU and 1GB memory. AWS command-line provides an easy way to generate a skeleton JSON file which can be used to define all instance attributes required to start a new EC2 instance. Its best to redirect the output of this command to a file, which we can then edit as per our requirements. I have updated the JSON file as per our requirements to build a t2.micro instance. Note: the values of KeyName, SecurityGroupIds, SubnetId have been taken from the resources we created in Part 1. The PrivateIpAddress is taken from the DNS JSON we created, with property name storage01.oracleraczone.net. After the JSON file is updated, running the following command will spawn our storage instance. This would output a long JSON output, search for InstanceId and note the value associated with it. Now that we have an instance running let’s ssh to the newly created ubuntu instance and install the required iSCSI software to make it storage server. Get the instance id from the JSON output from the instance creation command. Let’s create a new volume using the 150G disk we added while creating the instance. Update iSCSI config to scan this newly created volume and present it as network block device. Multicasting in networking terms is a group communication technique. It’s a one-to-many communication over network. Multicast uses network infrastructure efficiently by requiring the source to send a packet only once, even if it needs to be delivered to a large number of receivers. The nodes in the network take care of replicating the packet to reach multiple receivers only when necessary. (https://en.wikipedia.org/wiki/Multicast). Oracle Grid Infrastructure 11.2.0.2 introduces a new feature called "Redundant Interconnect Usage", which provides an Oracle internal mechanism to make use of physically redundant network interfaces for the Oracle (private) interconnect. As part of this new feature, multicast based communication on the private interconnect is utilized to establish communication with peers in the cluster on each startup of the stack on a node. Once the connection with the peers in the cluster has been established, the communication is switched back to unicast. Per default, the 230.0.1.0 address (port 42424) on the private interconnect network is used for multicasting. (https://community.oracle.com/thread/2398409?tstart=0). EC2 doesn’t provide an option to setup multicast out of the box. To setup a network for the interconnect we use point-2-point VPN for the RAC nodes using N2N. N2N enable instances to be members of a community which supports multicast IP among its members. Each member in the community run the edge component of N2N and get information about the other instances from the master or supernode. Creating EC2 install, click on EC2 from the AWS dashboard. Select the ubuntu image or the list. Select t2.micro instance for the instance types. Enter the information abou the network, subnet, IP address etc. Add the extra 150G storage as magnetic. This would be used as shared storage for Oracle RAC. Click Next, and add a name tag. Select the security group we created earlier and click, Next. 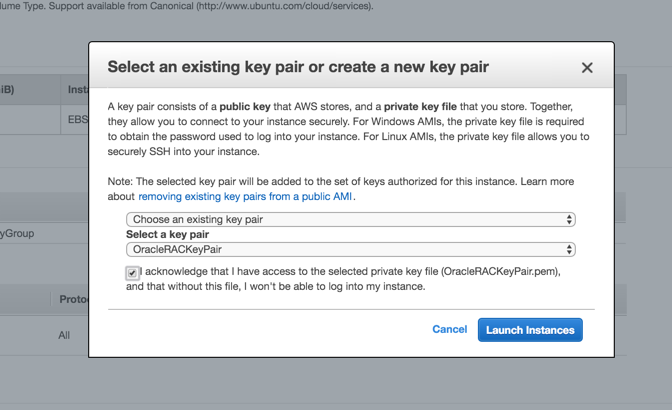 Select the correct Key-Pair and Launch instance. Review the status screen and click “View Instances”. After a while we can see an instance running. This completes the Shared Storage and N2N Setup via command-line and GUI.